Women's Original Tall Gloss Rain Boots is rated 4.5 out of 5 by 54. Presentada por primera vez en 1956, la bota alta Original está fabricada a mano a partir de 28 piezas y ensamblada para lograr un ajuste y una comodidad excepcionales. Este modelo concreto tiene un acabado muy brillante. Rated 5 out of 5 by Wendy from Great boots! Beautiful color, good quality. Fit was as expected. Rated 3 out of 5 by HelloKittyMom from Size Not Consistant I bought matte Thistle color size 7 and fits comfortable with room for medium thick socks. Then I bought this one in gloss and it’s tight. Original Tall Gloss is smaller and the right foot feels tighter than left. I also tried same size in adjustable back which was looser than matte boot. Not sure if this one is a dud or size is just different between matte and gloss. Rated 5 out of 5 by Mac27 from Beautiful I bought these because I needed another color. The purple is gorgeous. They fit well and I haven’t had any problems. Rated 5 out of 5 by Lexiloo from The are so cute and comfortable! I bought them for the snow and they look so cute! I will definitely purchase another pair in the future! Rated 5 out of 5 by Mrs.Griffin from Great for the weather & stylish Happy I brought these boots they are great for the nasty weather, as well as compliments my clothes. Rated 2 out of 5 by woody from Too Tall I bought this a month ago and had to return it. The boots were too tall and hit the bottom of my knees. I was very disappointed. Rated 4 out of 5 by teacher2 from Love the look! I had been looking for a stylish, comfortable rain boot, but couldn't find what I was looking for. 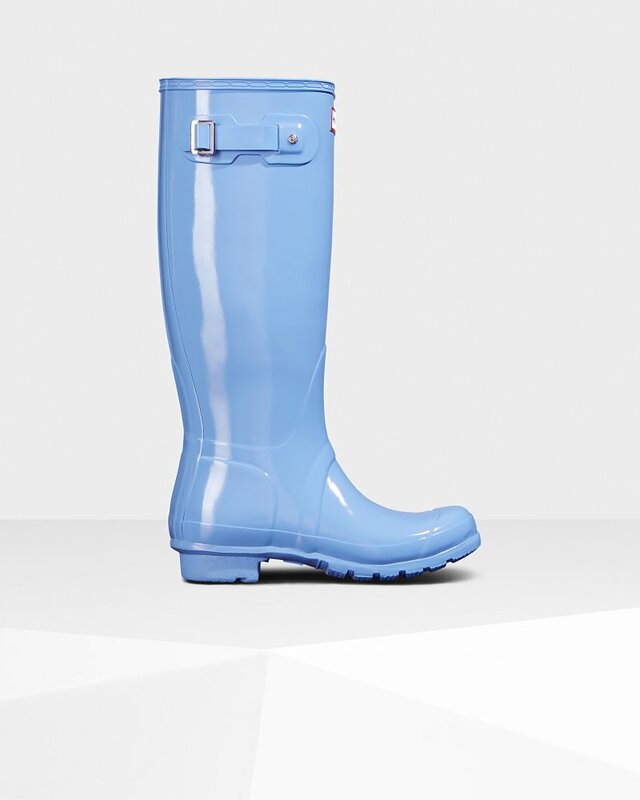 I decided to try the vivid blue Hunter boots. The color is a periwinkle blue to me, but very pretty. High quality rain boot. A little stiff, maybe, but still comfortable to walk in. If you are a half size, I would go down. That's what I did and still have room.